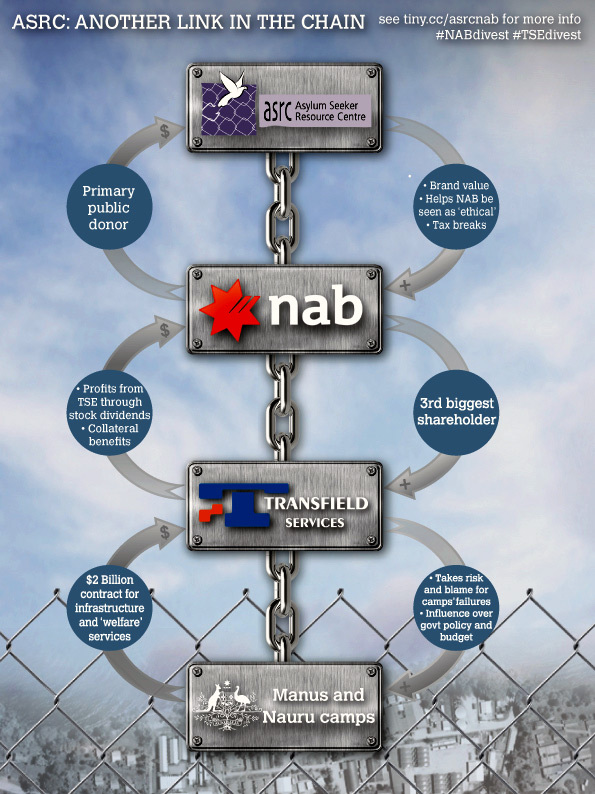 The National Australia Bank (NAB) is a substantial shareholder in Transfield Services. Transfield Services holds multi-billion dollar contracts to run the detention centres on Manus Island and Nauru. The NAB are major partners of the Asylum Seeker Resource Centre (ASRC). In return for funding from the NAB, the ASRC provides the NAB with a certificate of thanks, and acknowledgement of their partnership in ASRC’s Annual Report and related publications. Further, the NAB receives tax deductions for their donations to the ASRC. We believe that the members of the ASRC’s Board (who have many years of experience in finance and marketing) are well-aware of, among other things, the significance of NAB’s brand alignment with an organisation such as the ASRC. This is not the ASRC’s only connection to Transfield and other companies that profit from the detention camps. The Chair of the ASRC’s Board, Matthew Tutty, is the Chief of Staff for Telstra’s domestic retail business, and Telstra have multi-billion dollar contracts with Transfield announced at around the same time as Transfield massively expanded its contracts. Another Board member works for a company that has a multi-million dollar stake in Toll Holdings. Toll Holdings is the company that sold tents to the Australian Government for the detention centre on Nauru. The ASRC’s entanglements with the detention industry raise serious questions about the organisation and its role. While the ASRC relies on claims that it is opposed to the detention camps to garner support, donations and volunteers, the well-funded strategies it has pursued over the years have been demonstrably ineffective or stand in clear contradiction of that claim. On occasion, high-profile people (the ASRC’s ‘Ambassadors’) speaking on behalf of the ASRC have argued that asylum seekers should be put in labour camps and that Tasmania should be transformed into an island detention centre. Such statements clearly contradict the ASRC’s claim to be opposed to mandatory detention, and the ASRC has never retracted these statements. These statements of support for the detention of asylum seekers and have been accompanied by an approach that raises further questions about the role of the ASRC. The ASRC recently thanked the NAB for donating office furniture to its asylum seeker employment service in Dandenong. While this, along with the other small businesses that the ASRC runs, could be seen as providing an important service to asylum seekers in need, it is nevertheless also operating as a labour hire firm for cheap labour made possible by the precarious legal status of asylum seekers on temporary and bridging visas. The ASRC is a charity that solicits funds from private sources such as corporations and relies on a vast pool of volunteers. Its approach has been increasingly shaped by the precepts of privatised welfare and more than half of its Board is dominated by people from the business and finance sectors. This has oriented its approach and shaped its business model far more than have any serious considerations about how to bring an end the system of mandatory detention. Its criticisms of the system of mandatory detention have thereby been limited to ineffective but dramatic gestures that are only functional to expanding the ASRC’s business by raising funds and recruiting volunteers. If the ASRC wishes to credibly claim that it is opposed to the detention camps and the abysmal treatment of asylum seekers, it should begin by cutting its ties with a major shareholder in the internment camp industry, the NAB. Why do you continue to have a this article up that is inaccurate? Thanks Hugo. The status of the NAB’s shareholdings was posted this previous Friday, after the above article was written. It does not change the point of the article, since even granting that all of the subtractions & purchases might remain stable, the NAB’s stake in Transfield still makes it one of the largest institutional shareholders. But, as the ASX document makes clear, some of the transactions noted are short sells and cover buys – which means it has been a month of so in which the NAB engaged in lots of trades (both buying and selling) of TSE shares. Likely this has something to do with Transfield entering the US bond market very recently. Etc Etc. The point is that the decline in the NAB’s shareholdings does not suggest any inclination to divest from Transfield. Rather, it speaks to the fact that the NAB considers mandatory detention as chance for reaping profits and a bit of gambling in the sharemarket, as it has done in these recent trades by buying in low and selling while high. In any case, short sells are so defined because there is an expectation that they will be repurchased, usually once the shareprice declines again. These are the actions of a vulture. It has merely realised some profits while the shareprice is up, and expects to zoom in once again once it declines. The ASRC should disassociate itself from such vultures.